Hello Readerlings! 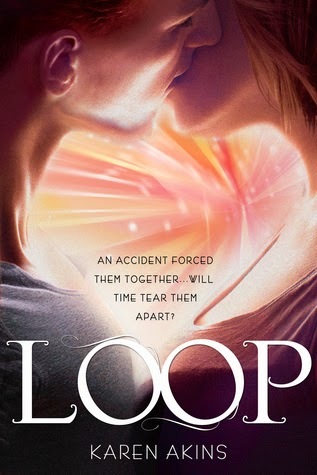 Today we are privilaged to have the author of LOOP, Karen Akins, here with us to talk about her new book, and about writing Time Travel! Check it out below and make sure read about LOOP below! The first thing I did was write the first draft, creating whatever rules of time travel I wanted in my own story. Thankfully, my first round of beta readers were sci-fi sticklers who asked some wonderful (and incredibly difficult questions). One of them actually addressed how the slight tilt in the Earth’s axis over two-hundred years could potentially affect where and how time travelers land in the past. So the second thing I did was decide just how detailed I wanted to get into the mechanics of time travel. Answer: enough to tell the story I wanted to tell. Not so much as to drive me crazy. I respect my readers, and I respect their imagination. Or leaving it a little more hazy? She was talking about one of the simplest, most basic processes of nature—something that happens every moment of every day in every blade of grass—and scientists haven’t figured it out. Because time travel might be at play. Most of the scientific musings of time travel I came across (and thanks to Einstein’s Theories of General and Special Relativity, there are many) agree on one thing. It is much more likely that we will, with the right technology, be able to time travel into the future rather than into the past. Unless there’s a wormhole involved.